How does one condense half a century of boundless love, compassion and service into a publication? 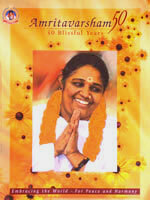 The Amritavarsham50 Commemorative Souvenir is a tribute to Amma’s divine guidance to humanity over the years. The souvenir was officially released by the Honourable Deputy Prime Minister of India, Shri. L.K. 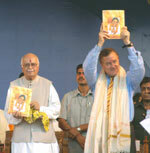 Advani, who handed the first copy to former U.S. Senator Larry Pressler, who accepted it on behalf of the world. This entry was posted in Books, Cultural. Bookmark the permalink.